Synnott Mountain Guides, the New England climbing school operated by world-renowned climber Mark Synnott, expands its climbing curriculum to include Mt. 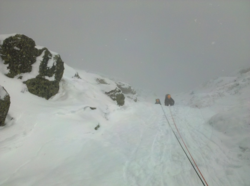 Rainier prep and Intermediate Mountaineering courses on Mt. Washington and throughout the White Mountains. As the rock climbing season gives way to winter climbing in New England, Synnott Mountain Guides is proud to announce new winter mountaineering courses. Mt. Washington Valley has served as the training grounds for Mark Synnott's expeditions to the Alaska Range, the Karakoram, Baffin Island and numerous other exotic climbing locations. It has also been the proving ground for many of the clients of Synnott Mountain Guides who have gone on to climbs ranging from Mt. Rainier to 8,000 meter peaks. The latest additions to the Synnott Mountain Guides winter climbing courses focus on providing mountaineering instruction to climbers with bigger objectives. The Mt. Rainier Prep mountaineering course offers specialized training for spring and summer Mt. Rainier summit climbs. This winter mountaineering course is designed to teach participants the skills necessary to climb Mt. Rainier and other similar glaciated mountains with confidence. Mt. Rainier Prep instruction includes ropework, knots, belaying, multi-pitch transitions, glacier travel, route finding, navigation, crevasse rescue and snow camping, among other key alpine climbing expedition skills. This mountaineering course also allows climbers to both evaluate their fitness and physical training for climbing Mt. Rainier as well as test their clothing and gear in an extreme winter environment. The Intermediate Mountaineering course gives mountaineers a chance to broaden their skills while completing worthy New England climbing objectives. This winter climbing course spans three days and several thousand feet of waterfall ice, mixed and steep snow climbing on some of the most classic alpine climbs in the White Mountains. The Synnott Mountain Guides Intermediate Mountaineering course also includes avalanche awareness, glacier travel and crevasse rescue instruction. Mark Synnott has taken on adventure in places like Patagonia , Pakistan , Nepal , India, China, Tibet, the Alaska Range, the Amazon, West Africa and Pitcairn Island in the South Pacific. When not in the mountains, Mark works with The North Face research, design and development teams and he lectures frequently on his life of adventure. He’s also a successful freelance photojournalist and a senior contributing editor at Climbing Magazine. His articles and photos have appeared in many publications in the U.S. and abroad, including National Geographic Adventure, Men’s Journal, Outside, Skiing and New York Magazine. Mark Synnott is also the author of Baffin Island – Climbing, Trekking & Skiing, a Baffin Island guidebook illustrated with stunning photos and detailed maps. In the last several years, Mark has been on climbing expeditions to Borneo, Chad and Newfoundland, all three of which also included climbing sensation Alex Honnold and fellow North Face climbing team member, whom Mark has had the pleasure of mentoring in regards to big wall and expedition climbing More information about Mark's climbing expeditions and Synnott Mountain Guides can be found at http://www.newhampshireclimbing.com.